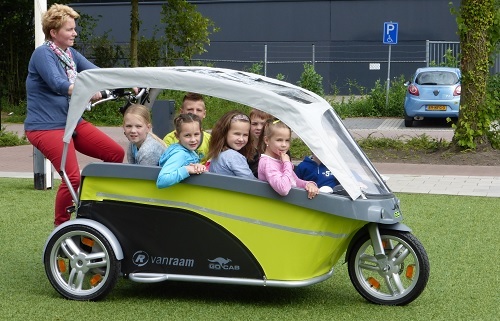 GoCab is an electric bicycle designed to make a taxi for children. The GoCab can comfortably carry up to eight boys and girls sitting in the front compartment, while being driven by an adult. The bicycle in question, designed and marketed by the company Van Raam, has high technical performance: reverse, eight gears, disc brakes and parking brake, protector for sun and rain and even a compartment to store backpacks and bags. bags of small passengers. The vehicle is intended for day care centers, schools, entities, or to accompany the park to groups of children at the end of classes. All in cities with bike lanes. GoCab has won several awards, such as the International Eurobike Award, the Innovation Award from Amsterdam Rai and the Dutch Design Week award. Thanks to the success of the product, currently the company’s engineers are working on the development of a new model with even more and better features.